The Canada goose is the largest species of true goose. Its scientific name, Branta canadensis, means "black or burnt goose from Canada." While Canada goose is the bird's official and preferred name, it is also known colloquially as the Canadian goose. Fun Fact: Canada geese fly in a V-formation, which improves aerodynamics so that they can migrate long distances. The Canada goose has a black head and neck and a white "chinstrap" that distinguish it from other geese (with two exceptions: the barnacle goose and cackling goose). The Canada goose's body plumage is brown. There are at least seven subspecies of Canada goose, but it's difficult to distinguish between some of them because of interbreeding among the birds. The average Canada goose ranges from 75 to 110 cm (30 to 43 in) in length and has a wingspan of 1.27 to 1.85 m (50 to 73 in). Adult females are slightly smaller and lighter than males, but they are visually indistinguishable. An average male weighs from 2.6 to 6.5 kg (5.7 to 14.3 lb), while an average female weighs from 2.4 to 5.5 kg (5.3 to 12.1 lb). Originally, the Canada goose was native to North America, breeding in Canada and the northern United States and migrating further south in the winter. Some geese still follow the usual migration pattern, but large flocks have established permanent residences as far south as Florida. Canada geese naturally reached Europe, where they were also introduced in the 17th century. The birds were introduced to New Zealand in 1905, where they were protected until 2011. Canada geese are mostly herbivores. They eat grass, beans, corn, and aquatic plants. They sometimes also eat small insects, crustaceans, and fish. In urban areas, Canada geese will pick food from garbage bins or accept it from humans. Canada goose eggs and goslings are preyed upon by raccoons, foxes, coyotes, bears, ravens, crows, and gulls. Adult Canada geese are hunted by humans and sometimes preyed upon by coyotes, gray wolves, owls, eagles, and falcons. Because of their size and aggressive behavior, healthy geese are rarely attacked. Geese are also susceptible to a variety of parasites and diseases. They suffer high mortality if infected by the H5N1 avian bird flu. Canada geese seek mates when they are two years old. Geese are monogamous, although a goose may seek a new mate if the first one dies. Females lay between two and nine eggs in a depression, such as a beaver lodge or are above a stream, on an elevated surface. Both parents incubate the eggs, although the female spends more time on the nest than the male. The goslings hatch 24 to 28 days after the eggs are laid. Goslings can walk, swim, and find food immediately upon hatching, but they are vulnerable to predators, so their parents fiercely protect them. During the nesting period, adult Canada geese molt and lose their flight feathers. The goslings learn to fly about the same time as the adult regain flight ability. Goslings fledge between 6 and 8 weeks of age. They remain with their parents until after the spring migration, at which time they return to their birthplace. The average lifespan of a wild goose ranges from 10 to 24 years, but one goose is known to have lived to the age of 31. Most Canada geese undertake a seasonal migration. In summer, they breed in the northern part of their range. They fly south in autumn and return to their birthplace in spring. The birds fly in a characteristic V-shaped formation at an altitude of 1 km (3000 ft). The lead bird flies slightly lower than its neighbors, forming turbulence that improves the lift of the birds behind it. When the lead bird gets tired, it drops back to rest and another goose takes its place. Typically, geese migrate at night, which allows them to avoid nocturnal predators, take advantage of the calmer air, and cool themselves. Thyroid hormones are elevated during migration, speeding goose metabolism, altering muscle mass, and lowering the minimal temperature for muscle performance. In the United States, the Canada goose is the second-most damaging birds for airplane strikes (turkey vultures are the most damaging). Most crashes and fatalities occur when a goose strikes an aircraft engine. The Canada goose is more dangerous to aircraft than most birds because of its large size, tendency to fly in flocks, and ability to fly extremely high. 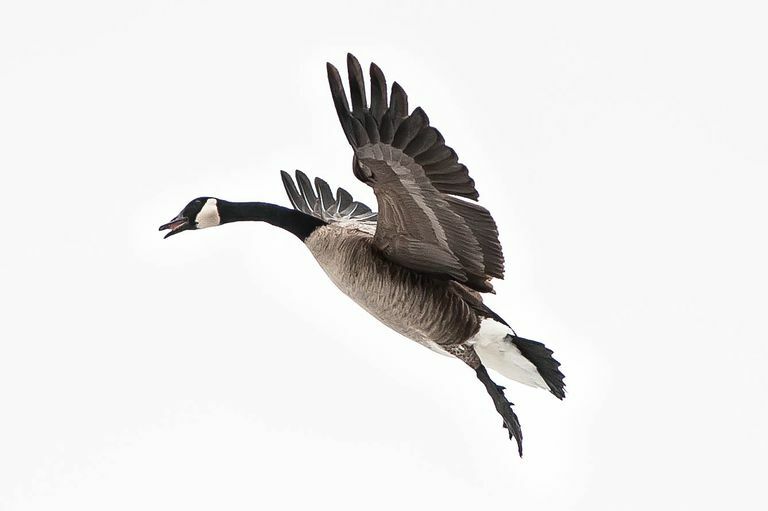 The flight ceiling of the Canada goose is unknown, but they have been documented at heights up to 9 km (29000 ft). Several methods are used to reduce the likelihood of aircraft strikes. These include culling, herding, and relocating flocks near airports, making the habitat less attractive to the geese, and applying aversion tactics. By the early 20th century, overhunting and habitat loss lowered Canada goose numbers so significantly that the giant Canada goose subspecies was believed to be extinct. In 1962, a small flock of giant Canada geese was discovered. In 1964, the Northern Prairie Wildlife Research Center started operations in North Dakota to restore the goose population. Currently, the IUCN Red List categorizes the Canada goose as "least concern." With the exception of the dusky Canada goose subspecies, population numbers continue to grow. 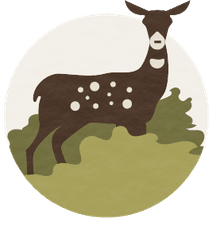 Habitat change and severe weather are the primary threats to the species. However, the goose's ready adaptation to human habitats and the lack of predators more than offsets threats. The Canada goose is protected outside of hunting seasons by the Migratory Bird Treaty Act in the United States and the Migratory Birds Convention Act in Canada. Hanson, Harold C. (1997). The Giant Canada Goose (2nd ed.). Southern Illinois University Press. ISBN 978-0-8093-1924-4. Long, John L. (1981). Introduced Birds of the World. Agricultural Protection Board of Western Australia. pp. 21–493. Palmer, R. S. (1976). Handbook of North American birds, Vol. 2: Waterfowl. Pt. 1. Yale Univ. Press, New Haven, CT.